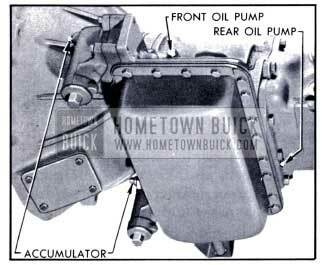 When improper operation of a 1951 Buick Dynaflows transmission is reported, time and expense will usually be saved by first making a thorough road test to observe operation in all ranges under appropriate driving conditions. The road test will also serve to thoroughly warm up the transmission, which is required for any tests made in the shop. The person making the road test should be familiar with the operation and performance of Dynaflows Drive in all ranges so that he will be able to detect any sub-standard condition. The required “feel” of a Dynaflow car can best be acquired by driving through a test routine on a number of cars whose performance is known to be satisfactory. Knowledge of which parts are in operation and which hydraulic controls govern operation in each range is essential to intelligent diagnosis, therefore, a study of paragraphs 4-18 through 4-22 is recommended. The road test should cover operation in Direct Drive, Low and Reverse, also operation when shifting between Low and Direct Drive under load. The test should include steep grade as well as level road operation when possible. Operation in forward ranges after extended operation in Reverse should be tested. Slip or over run of engine should be checked. The degree of creep in all ranges with car stopped on level road and engine idling should be observed. The importance of this overall test can be illustrated with the complaint of “excessive slip.” The owner may report excessive slip in Direct Drive, which would lead to the assumption that the direct drive clutch is at fault. The road test may reveal that slip also occurs in Low and Reverse, at which time the clutch is disengaged. Slip in all three ranges indicates low oil level, improper control linkage adjustment, or improper pump pressure. These possible causes may be corrected in considerably less time than any work on the direct drive clutch; furthermore, work on the clutch would not correct the trouble in this case. After the road test described above, a number of shop inspections and tests should be made while the transmission is thoroughly warmed up to operating temperature. Check Oil Level. In every case of a transmission complaint first check the oil level as described in paragraph 1-1 (step 5). If oil level is low bring it to proper level and check the effect on operation before doing further work. If oil level is low and the car history indicates oil loss of one pint or more per 1000 miles, or transmission exterior is oily, a thorough inspection for oil leakage should be made as described in paragraph 4-25. Check Manual Control Linkage. In cases of improper operation in one or more ranges it is always advisable to check the adjustment of transmission manual control linkage as described in paragraph 4-26. Test Oil Pressure s in Hydraulic Control System. When diagnosing almost all cases of improper operation it is necessary to have accurate knowledge of oil pressures in the hydraulic control system. The following oil pressure tests should be made before performing any mechanical work. Before making the pressure tests oil level must be correct (paragraph 1-1, step 5) and the transmission must be thoroughly warmed up to operating temperature. Place rear end of car solidly on car stands or use a free wheel type hoist so that plugged ports can be reached and transmission can be operated with rear wheels free to turn. To test front oil pump pressure, remove pipe plug on left side of transmission case and connect Pressure Gauge J 2575. See figure 4-65. To test rear oil pump pressure, remove pipe plug in lower flange on front end of rear bearing retainer and connect Pressure Gauge J 2575. See figure 4-65. To test pressure in high or low accumulator, remove pipe plug from front side of accumulator body and connect Pressure Gauge J 2575. See figure 4-65. Run engine at 500 RPM and test pump and accumulator pressures in Low, Drive and Reverse. Test front oil pump in all ranges and rear oil pump in all but Reverse. Test high accumulator only in Drive and test low accumulator only in Low. Repeat tests at 1000 RPM and 1800 RPM in Low and Drive only. Record the pressure obtained in each test. 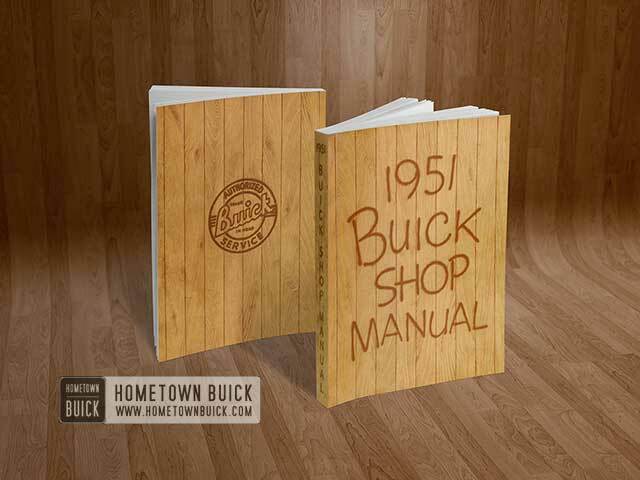 This can be most conveniently done by using the 1951 Buick Dynaflow Diagnosis Guide (BPS 6.24) which is available through Buick zone offices and distributors. The pressures that should be obtained on each test are printed on the Diagnosis Guide and space is provided for inserting the actual pressures obtained. See figure 4-66. The Guide also provides for oil leak checks, and the rear side gives a summary of usual complaints and suggested corrections. Low or erratic oil pump pressure indicates an air leak into the pump suction line, faulty pressure regulator valve operation, or excessive clearance in pump. Low rear pump pressure also may be caused by a leak in the valve and servo body passages which connect the rear pump with the pressure regulator valve. If pressure of one pump is low but pressure of other pump is satisfactory, however, air leaks into suction line and faulty pressure regulator valve are eliminated as possible causes since both pumps use a common suction line and the same valve regulates pressure of both pumps. Very low accumulator pressure may be caused by external or internal leakage past the accumulator body gasket. A difference of more than 10 psi between front pump and an accumulator indicates an excessive leak between the accumulator and the clutch (if high accumulator pressure is low) or the low servo (if low accumulator pressure is low), or else the metering orifice in accumulator is restricted or plugged. With the results of the road test and the pressure tests in mind, the cause of improper operation in most cases can be ascertained by using the suggestions given under the following paragraph 4-24. 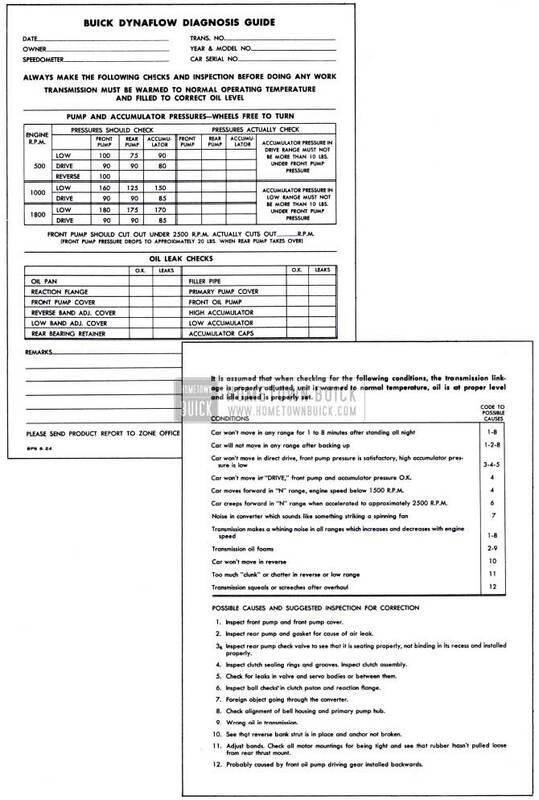 Where paragraph numbers in parenthesis () are shown below they refer to other paragraphs in this manual where the required adjustment or repair procedure is given. Improper adjustment of throttle dash pot (par. 3-8). Engine not properly tuned up (par. 2-9). Transmission contains water or improper oil (par. 1-4). Air leak into hydraulic system at rear oil pump gaskets (par. 4-29, i). Excessive clearance between output shaft and rear bearing retainer bushing (par. 4-35). If car will not move for 1 to 8 minutes after standing over night, park car for several hours with engine stopped and then check front oil pump pressure. A zero reading until such time as car will move indicates that front pump loses its prime due to excessive clearances. Inspect front pump (par. 4-32). If condition has existed for some time it is advisable to inspect clutch and bands for excessive wear due to slippage at low apply pressure (par. 4-34). If car will not move in any range after extended operation in Reverse it indicates air leakage into pump suction line and excessive clearance at front oil pump. Front oil pump pressure will be very low during period when car will not move. Inspect for air leaks at rear oil pump gaskets (par. 4-29, i). Inspect front oil pump and cover for excessive clearances (par. 4-32). Parking lock engaged or parking brake applied. Lock up due to broken part in rear axle or transmission. If front oil pump and high accumulator pressures or OK, remove and inspect clutch assembly (par. 4-34). If front oil pump pressure is OK but high accumulator pressure is low and accumulator body gasket is not leaking internally, inspect for leaks in reaction flange gasket. If gasket is satisfactory, inspect clutch piston outer seal and ball check, also oil sealing rings on hubs of reaction shaft flange and low drum (par. 4-34). Reverse servo inoperative (par. 4-31). Band improperly adjusted (par. 4-38, j) or band operating strut has dropped out of place. If condition occurs only after operation in Reverse, see subparagraph c (2) above. Low oil level (par. 1-1). Manual control linkage improperly adjusted (par. 4-26). If front oil pump pressure is low, remove and inspect pressure regulator valve and all valve and servo body gaskets (par. 4-31). If cause is not found remove and inspect front oil pump for wear or excessive clearances (par. 4-32). Inspect pump cover and reaction shaft flange gaskets for leaks. If pressure at high accumulator is low, check for leak at accumulator body gasket. If gasket is OK remove and inspect clutch plates, sealing rings and clutch piston (par. 4-34). Low band improperly adjusted (par. 4-38, j). If pressure at low accumulator is low, check for leak at accumulator body gasket. If gasket is OK remove valve and servo body and check for gasket leaks and condition of low servo piston seal (par. 4-31). Low band and drum scored or worn. Reverse band improperly adjusted (par. 4-38, j). Check for strut out of place or broken anchor. If front oil pump pressure is low remove valve and servo body and check for gasket leaks and condition of reverse servo piston seal (par. 4-31). Reverse band and ring gear scored or worn. Remove valve and servo body and check for low servo piston sticking up. Remove clutch and inspect for sticking, warped or improperly assembled clutch plates. Note whether “cone” of steel plates is in same direction on all plates. If creep occurs only when engine is accelerated to approximately 2500 RPM, pay particular attention to condition of check balls at vents in clutch piston and reaction shaft flange (par. 4-34). If high accumulator pressure is low remove accumulator and check body gasket. Check for accumulator piston sticking down. Top land of piston must be fully visible through top port in body (par. 4-33). If accumulator and gasket are OK, inspect for leaks in valve and servo body gaskets. Binding or worn clutch plates (par. 4-34). NOTE: A very slight chatter just as car starts to move in reverse, which disappears as soon as car is in motion, may be considered normal. A slight “clunk” when shifting into Low or Reverse is also normal. Check engine and transmission mountings for tightness. Inspect for broken rubber thrust pad at transmission mounting. Low or Reverse band improperly adjusted (par. 4-38, j). If (1) and (2) do not correct trouble, direct drive clutch may be dragging. Remove clutch and inspect for sticking, warped, or improperly assembled clutch plates. Note whether “cone” of steel plates is in same direction on all plates (par. 4-34). Inspect for excessive wear of reverse ring gear bushing. Check for foreign matter in planet pinion needle bearings (par. 4-36). A hum or low whine in Neutral or Parking is normal since all planetary gears are free to rotate without the steadying effect of a load. Some hum also may be expected in Low and Reverse. When diagnosing abnormal noises in the transmission consideration should be given to the parts that are in motion when the noise occurs. The presence or absence of noise in each range should be noted so that the parts which cause the noise can be determined by a process of elimination. A buzzing noise can be caused by low oil level, or by the front pump delivery check valve seating on the edge of the gasket between valve and servo bodies. A buzzing noise, noticable in Parking and Neutral, may be caused by excessive clearance of pressure regulator valve in valve body or an oversize orifice in valve land; correction requires replacement of valve and body (par. 4-31). A clicking noise in all ranges may be caused by a foreign object going through the converter. A clicking noise only when car is in motion may be caused by the parking lock pawl contacting the ratchet wheel due to improper manual control linkage adjustment (par. 4-26). Abnormal hum or whine which occurs in all ranges may be attributed to worn parts or excessive clearances in the front oil pump. Noise caused by the front pump will increase in Low and will diminish at car speeds above 45 MPH in Direct Drive. It increases and decreases with engine speed in all ranges. When excessive clearances exist in front oil pump the pressure test (par. 4-23, c), will usually indicate low front pump pressure. Squealing or screeching immediately following installation of front oil pump parts indicates that the driving gear has been installed backwards. This condition should be corrected without further operation of transmission as severe damage will result. Abnormal hum or whine in all ranges but Direct Drive may be attributed to conditions in the planetary gear train since these gears are locked in Direct Drive but either idling or transmitting power in all other ranges. If the transmission is found consistently low on oil, indicating loss of 1 pint or more per 1000 miles, a thorough inspection should be made to locate and correct all external leaks. An inspection for external leaks also should be made if the oil pump and accumulator tests described in paragraph 4-23, (c) show low oil pressure, since leaks at some gaskets which affect pressure will show externally. If the exterior of transmission is not wet with oil or the following inspection procedure does not reveal any external oil leaks, check the lubricant level in the rear axle housing. An overfilled rear axle housing indicates leakage past the propeller shaft spline seal. The rear axle should be disconnected at torque ball flange for inspection of this seal (fig. 5-3). CAUTION: Discard rear axle lubricant that has been diluted with oil from a 1951 Buick Dynaflow Transmission. In some cases, oil leaks which show externally can be corrected without removal of transmission, but in other cases removal is necessary. For this reason it is very important to locate the source of an external oil leak before removal of transmission in order that the cause can be definitely identified during disassembly operations. In the disassembly operations given in Section 4-E, attention is always directed to inspection of each gasket at time of removal since at that time the clues to leakage are clearly shown in the condition of gasket and the imprint of adjoining parts. If exterior of transmission is oily, first make certain that the oil is not coming from the engine, since engine oil caught in the air stream will be thrown back over the transmission. If engine upper or lower crankcase is wet with oil, thoroughly wash and dry then run engine until cause of engine oil leakage is found and corrected. To check for transmission oil leakage place car on high car stands or a free wheel type hoist so that engine and transmission can be operated with rear wheels free and transmission can be inspected. Remove the bell housing cover and hand hole cover. Thoroughly clean the inside of bell housing and surfaces of flywheel and primary pump as far as possible. Use carbon tetrachloride or other non-inflammable quick-drying cleaner. It is impossible to locate the source of an oil leak unless all visible surfaces are clean and dry. Start engine and operate transmission in Direct Drive until transmission is warmed up or until an oil leak becomes evident. Thoroughly inspect for evidences of fresh oil at the following points. The Diagnosis Guide, figure 4-66, provides a convenient means of recording the results of this inspection. Low and Reverse adjustment hole cover. Oil gauge rod filler pipe. Rear bearing retainer at flanges, cross shaft bearing seal and torque ball. High and low accumulator plugs, caps and body gaskets. Reaction shaft flange to front oil pump cover and to transmission case gaskets. Face of flywheel and interior of bell housing. Even though oil does not show in interior of bell housing check for oil leaks at primary pump cover and at front oil pump. To check primary pump cover hold a piece of white paper or cardboard between flywheel and bell housing. To check front oil pump insert a long roll of paper through hand hole toward the pump. If oil is leaking at either place oil spray will be visible on the paper. After inspecting transmission while operating in Direct Drive shift to Low, run engine at 1000 RPM and repeat the inspections outlined. The higher pump pressure existent in Low may cause a leak to show that would not be evident at the lower pressure existent in Direct Drive. A leak at an adjustment hole cover may be corrected by removing cover and installing a new cover gasket. An oil leak at connector hose of filler pipe may be corrected by tightening hole clamps or replacing the hose. Leaks at junction of filler pipe with oil pan may be corrected by silver soldering. An oil leak at the cross shaft bearing seal may be corrected by removing the bearing and replacing the seal. Seal must be installed with grooved side facing inward. If oil leaks at joint between rear bearing retainer and transmission case tighten the seven %” bolts to 35-40 ft. lbs. torque with transmission hot. If gasket is blown out at the bottom, or tightening of bolts fails to correct leak, the rear bearing retainer must be removed for inspection. If oil leaks at torque ball examine the boot for cracks and proper installation at both ends. Tighten retainer bolts to 30-35 ft. lbs. torque. If leak still exists, it will be necessary to remove torque ball for inspection. If oil leaks at oil pan gasket carefully tighten all bolts and nuts to 15-18 ft. lbs. torque. If bolts and nuts are tight, or tightening fails to correct the leak, remove pan for inspection. Remove old gasket and clean oil pan thoroughly. Inspect pan for cracks or other damage, and check mounting flange with straight edge. If pan is cracked or flange is uneven and cannot be trued up satisfactorily, replace oil pan. Install old or new pan and after transmission is warmed up again tighten bolts and nuts to 15-18 ft. lbs. torque. If oil is leaking around accumulator cap remove cap and coat threads with Permatex No. 3. Install cap with a new gasket and tighten to 40-50 ft. lbs. torque. If oil is leaking at accumulator body gasket, inspect for broken flange on body. Replace accumulator if flange is broken, otherwise tighten bolts and nuts to 20-25 ft. lbs. torque. If leak continues, remove accumulator for inspection. Inspect gasket for condition and imprint of accumulator body. Test mounting surface of accumulator body with straight edge and if it is uneven disassemble accumulator and true up the surface as described in paragraph 4-33. If body is porous or cracked replace accumulator assembly. Reinstall accumulator with new gasket placed so that small drain hole lines up with drain hole in reaction shaft flange, then tighten bolts and nuts to specified torque. If oil leak is at gasket between reaction shaft flange and transmission case tighten accumulator bolts to 40-50 ft. lbs. torque. If leak is at gasket between the flange and the front oil pump cover tighten the bolts and nut at outer lower corners of pump cover. If tightening does not correct the leak it will be necessary to remove transmission for inspection of parts at this point. An oil leak showing on front side of flywheel is probably caused by loose converter drain plugs which must be tightened. If plugs are not leaking check for leakage past the crankshaft rear bearing. If an oil leak at primary pump cover is indicated by the test with paper (subpar. a), tighten all primary pump cover bolts to 30-35 ft. lbs. torque, following the sequence shown in figure 4-15. If this fails to correct the leak it will be necessary to remove the transmission for inspection of parts at this point. If an oil leak at front oil pump is indicated by the test with paper it will be necessary to remove the transmission for inspection of front oil pump and primary pump hub. Before r moving transmission, wash and dry the interior of bell housing again, then run in Direct Drive until the first indication of oil appears on the roll of paper and shut off engine. This procedure will leave a clear oil marking at the source of the leak which will aid in correction when transmission is disassembled at front oil pump. Internal oil leaks which affect transmission operation are indicated by the oil pump and accumulator pressure tests described in paragraph 4-23 (c). Since low pump or accumulator pressure can be caused by faulty pressure regulator valve operation or leaks at joints between the valve body, servo body, and transmission case it is advisable to first remove the valve and servo body assembly for inspection as described in paragraph 4-31. This can be done without removal of transmission. It is also advisable to check the condition of accumulator body gasket. If the cause of the internal leak is not disclosed by this work it will be necessary to remove the transmission for inspection of pumps and direct drive clutch. When a 1951 Buick Dynaflow transmission does not operate properly it is advisable to first check the manual control linkage to make sure it is correctly adjusted. Before making any checks or adjustments on manual control linkage make certain that transmission is thoroughly warmed up and that oil is at proper level. To warm up transmission, drive car approximately 20 miles, with frequent stops and starts as might be encountered in heavy traffic. Place shift control lever in Neutral (N) position so that detent plunger is centered in detent notch, then move control lever until stop pin is against stop in dial housing and note the movement of dial pointer. Repeat this operation in the Low (L) position. The movement of dial pointer should be approximately equal in Neutral and Low. If it is not, loosen the control detent mounting bolts (fig. 4-67) and shift detent until movement of dial pointer is equal in both ranges. Tighten mounting bolts securely. Place shift control lever in Low (L) position and carefully bend dial pointer, if necessary, to center the pointer behind the letter “L” on dial. Park car on ramp or steep grade with control lever in Parking (P) position to determine whether parking lock holds securely. Then let car roll with control lever in Neutral (N) position and listen for a clicking or ratchet noise which would indicate that parking lock pawl is contacting the parking lock ratchet wheel. If parking lock fails to hold, or ratchet noise exists in Neutral, adjust shift rod as described in Steps 6, 7, 8; otherwise proceed to Step 9. Place control lever in Parking (P) position and- disconnect shift rod from shift idler lever by removing clevis pin and spring washer. See figure 4-67. Pull forward on shift rod and move car slightly to make sure that locking pawl is fully engaged in ratchet wheel. Do not jerk on rod as this may spring linkage in rear bearing retainer. Check movement at lower end of transmission shift lever by pushing forward against spring pressure until a definite stop is felt. 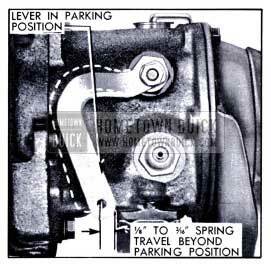 The spring travel or movement of lower end of lever should be 1/8″ to 3/16″ beyond the Parking (P) position. See figure 4-68. If spring travel is not within these limits the control valve operating rod in transmission is incorrectly adjusted and it will be necessary to remove the torque ball and adjust the operating rod as described in paragraph 4-38 (g). When spring travel is correct pull shift rod forward until stop is felt then adjust shift rod clevis until clevis pin will just enter hole in shift idler lever, with control detent firmly engaged in Parking (P) position. Lengthen shift rod by unscrewing clevis 3 complete turns, then temporarily connect rod to idler lever with clevis pin. Place shift control lever in Neutral (N) position making sure that detent is firmly engaged, then install Shift Control Linkage Adjustment Gauge J 3085 on dial housing with the line under “N” centered on the dial pointer. See figure 4-69. With transmission warmed up and engine idling at approximately 600 RPM, slowly move control lever from Neutral (N) to Drive (D) position. The clutch should engage, as indicated by an immediate decrease in engine speed when the tip of dial pointer is behind the long gauge mark located midway between “N” and “D” on speed ratio dial. See figure 4-69. The width of this mark provides for the allowable variations in shift point. Slowly move control lever from Drive (D) position to Neutral (N) position. Clutch should disengage, as indicated by an immediate increase in engine speed, when tip of speed ratio pointer is behind the midway mark on gauge, as in Step 10. If points of clutch engagement and disengagement are not as specified adjust shift rod clevis (Steps 6, 7, 8) to obtain required setting, being careful not to change clevis so much that parking lock fails to hold or parking lock pawl contacts ratchet wheel in Neutral (N). Check operation in Low (L) and Reverse (R). 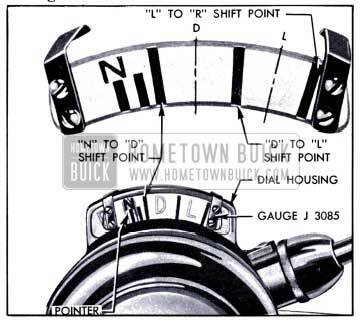 Low and Reverse should be obtained when detents are engaged and the shift points should occur when tip of dial pointer is behind the corresponding shift point marks on Gauge J 3085 shown in figure 4-69. If these conditions are not correct, the transmission shift lever may be bent. After adjustments are completed, tighten clevis lock nut securely and permanently install clevis pin with spring washer located between shift idler lever and clevis; install cotter pin. See figure 4-67. After any change in control detent and shift rod always check neutral safety switch timing (par. 10-34), and back-up lamp switch adjustment (par. 11-3) before removing Gauge J 3085.